After answering a ton of hate email and mean comments let me take a minute and let you know that I have undone the changes we made to the site last week. Before some of you cheer and celebrate victory please know that this is a very sad moment for me. Progress is a good thing. Really. I was a little shocked as to how upset a login makes some of you and also taken aback at the reasons you felt I would do this. So let me take a second and share why we made logging in required (for the short 5 days that it was). Cost is the #1 reason. To maintain separate code for two different shopping list systems not to mention separate servers is incredibly expensive. Since you aren’t asked to pay to use the site, I have to work to keep costs in control. Maintaining the servers on Southern Savers costs money every month as does the cost for developers to update and fix code (think more than a mortgage). Secondly, we built this for you. Imagine a shopping list that knows what newspaper you have and only shows coupons from your area… or the item search that only shows you sales that you care about in your area when you search for best deals on products that you love. These are features that no other site has, and they were built to make all of this easier and less time consuming. Once you are logged in the system remembers that for over a month. Folks complained that it wastes time… it’s a one time deal… and you’re good… for a month. This isn’t like Kellogg’s that will make you log in every time you print a different coupon (that’s truly a frustrating site if we want to start pointing fingers). I have no desire to track what you are buying and would never sell that information even if I could. You seem to think that I have extra time on my hands. The only tracking we are doing is for the next project we are working on. We are adding an alerts feature that will notify you when things you want us to track go on sale. But guess what, you’ll have to log in for that! 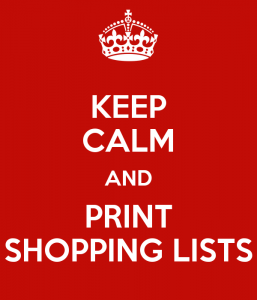 As for right now, go and print all the lists you like, you don’t have to log in. I’ll go back to the drawing board on how to make this work for everyone.